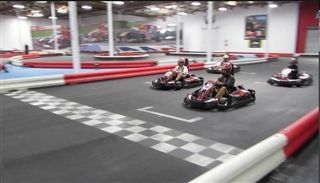 8th graders spent a day at K-1 Speed putting their Conceptual Physics knowledge in motion. Students were briefed by the K-1 Speed staff on safety and driving strategy before donning head socks and helmets for a chance to feel centripetal motion when rounding a high-speed corner, test the limits of friction when breaking and steering and attempt to post the fastest lap time. When students weren't racing, they were solving problems related to the physics involved in the acceleration, turning, and power of the electric carts. The outing gave students an opportunity to use the knowledge and skills they have acquired in Conceptual Physics during the last trimester and a half.